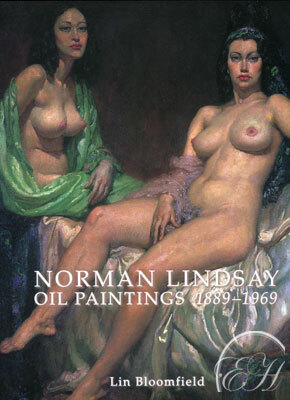 Etching House is proud to carry in stock this amazing book of Norman Lindsay Oil Paintings 1889-1969 Price is $473 for 308 pages of brilliant art by the Australian Icon, published in 2006 edition is to 500, Norman Lindsay: Oil Paintings 1889-1969 is an important art reference book to own. Over a period of eighty years Australian artist Norman Alfred Williams Lindsay (1879-1969) painted in oils. Apart from the classical portraits and single figure nudes Lindsay painted from life, he gathered the content of his oils from many sources. These include his own imaginings; writers and poets whose work he admired; historical events; Greek and Roman mythology; piracy and the Spanish Main and his abhorrence of war. This volume contains one hundred and eighty oil paintings in full colour including one hundred featured oils, from his first known attempt at age ten to his last, a month before his death. Two hundred and fifty additional supplementary works in a variety of media are reproduced together with over 55,000 words of text. Price: A$ 473.00 at Etching House.